Posted on January 24, 2017 by Barry V.
AHHHH – the Berkshires in autumn: cold nights, crisp dawns, and warm afternoons! 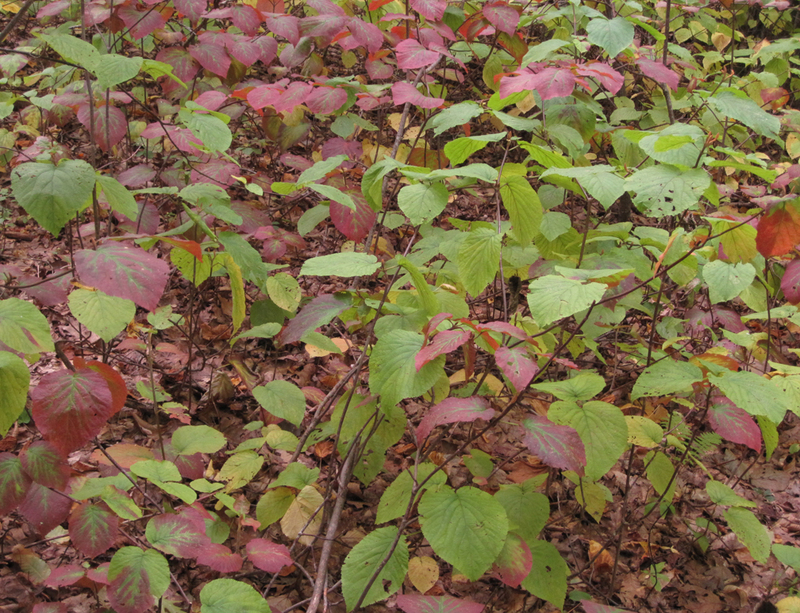 The landscape is still predominantly summer-green, but the swamp maples are flush with color and the hills, too, are painted with strokes of carmine, orange, gold and violet. At Pike’s Pond, I hear some harsh croaks and look up to see two ravens frolicking in the air currents over Lenox Mountain, while beyond them a parade of Turkey vultures drifts southward. 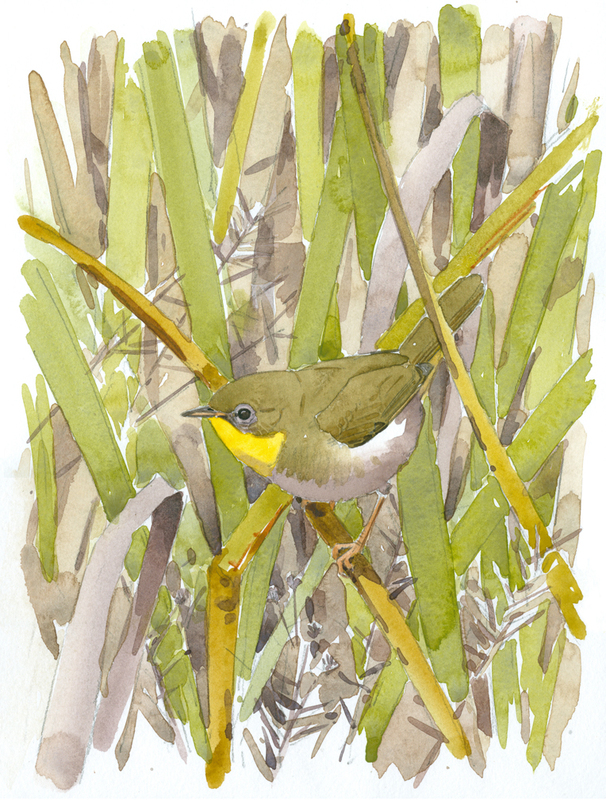 Nearby, a common yellowthroat engages me in a game of hide-and-seek from a stand of cattails. 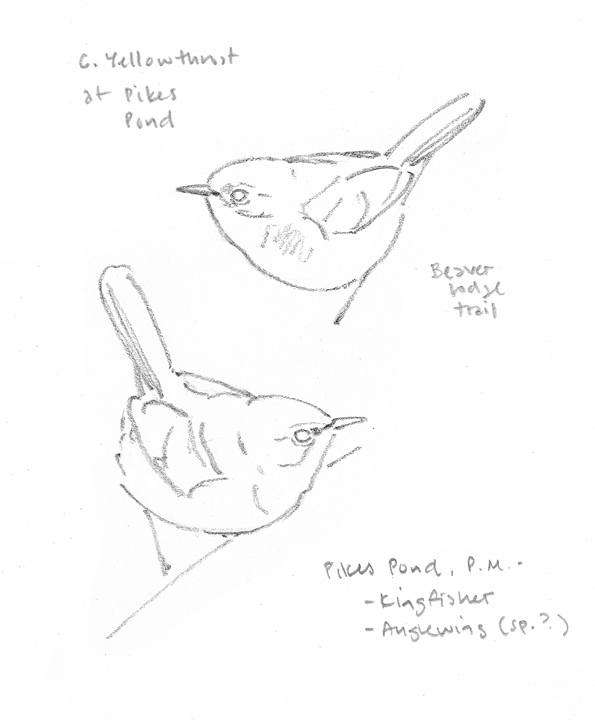 I see many yellowthroats around the sanctuary today, but only one with the black mask of an adult male. 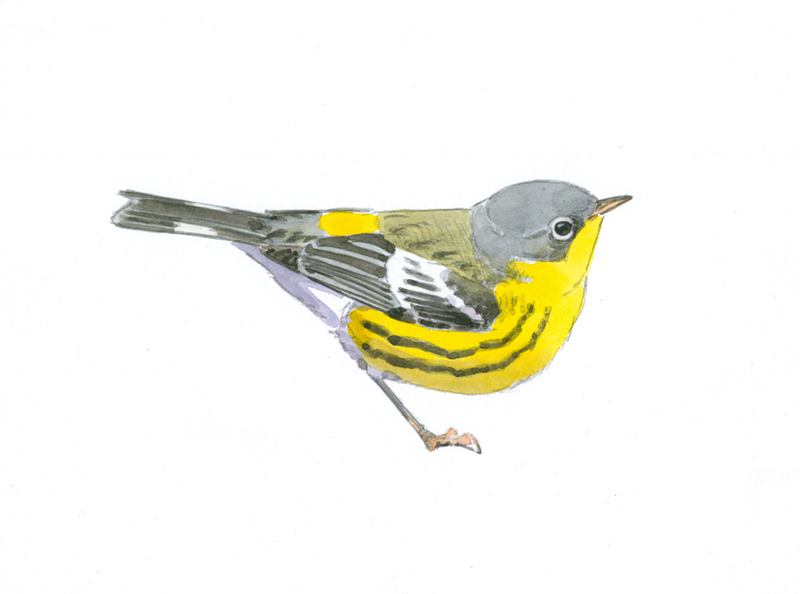 I make a circuit of the Yokun Brook, Old Wood Road and Beaver Lodge Trails, and encounter a few waves of migrant warblers, among them a magnolia and palm warbler. Their fall plumages are a ghostly version of their springtime finery. 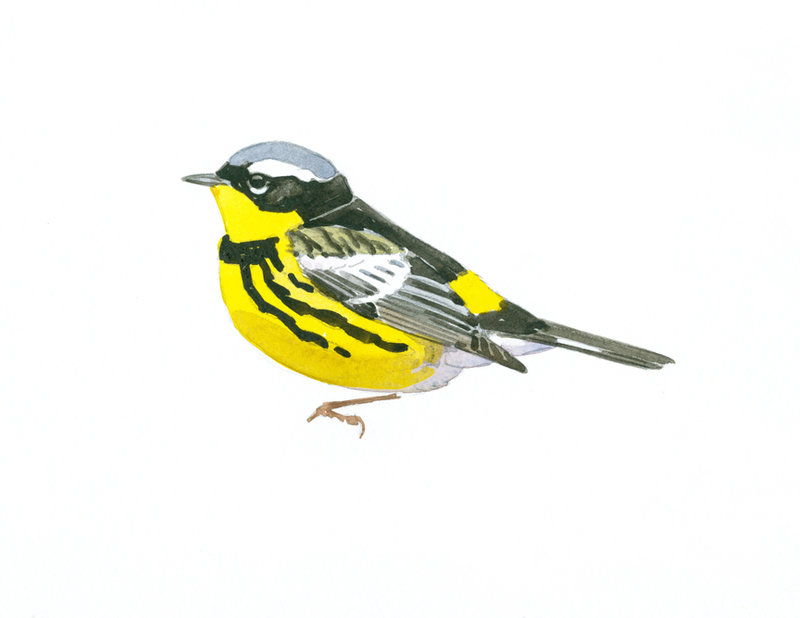 Compare the male magnolia warbler I painted last May at Marblehead Neck with this non-breeding male at Pleasant Valley. I knew that the Trail of the Ledges would be steep and challenging (the trail map instructs NOT to attempt DESCENDING this trail! ), so I leave my scope and binoculars in the car, carrying only my pack-stool loaded with art supplies, a drink and some snacks. 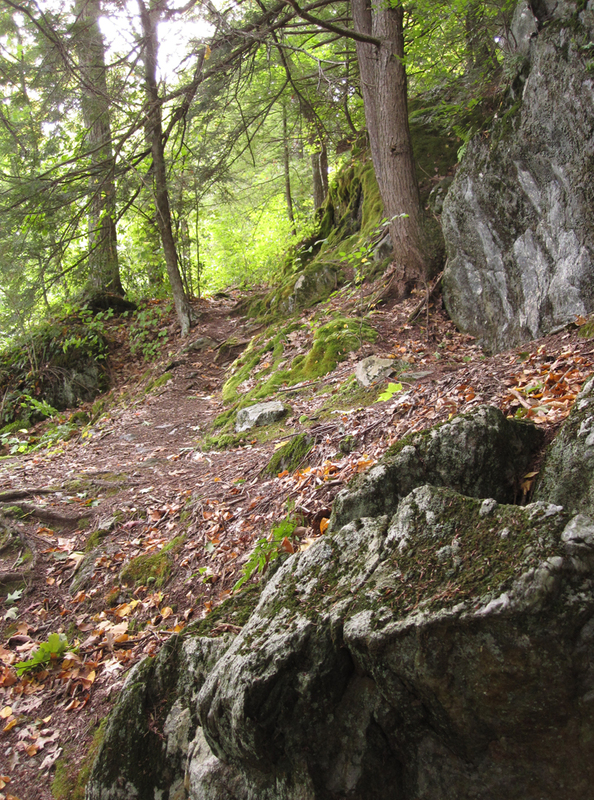 The lower portion of the trail is steepest, with hand-over-hand climbing in many spots – more like crawling than hiking! As I climb, the plant communities reflect the change in elevation. I pass through dark stands of hemlock and copses of hobblebush. 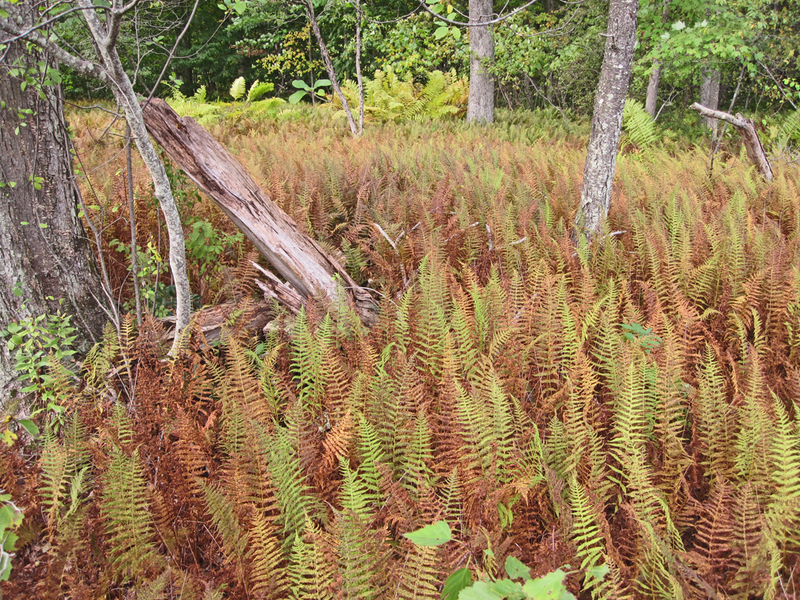 Down among the rocks at my feet are clumps of common polypody, stunted by the thin, nutrient poor soils. I’m fascinated by these miniature ferns – most fronds only about an inch wide. In normal situations, the polypodys would tower over the partridgeberry, but here they are in pleasing scale. There are two scenic overlooks on the way up the Ledges Trail. The first is a narrow window through the trees looking south. The second is more open; with a view east back towards the Sanctuary. I decide to set up and paint this view. The Sanctuary is on the slopes below me, wrapped around the base of the mountain, so you cannot see it from this high viewpoint. What you DO see is the town of Lenox spread out below, and beyond that the hills that roll eastward into the Pioneer Valley. The view from the summit of Lenox Mountain is more dramatic, and well worth the extra hike. 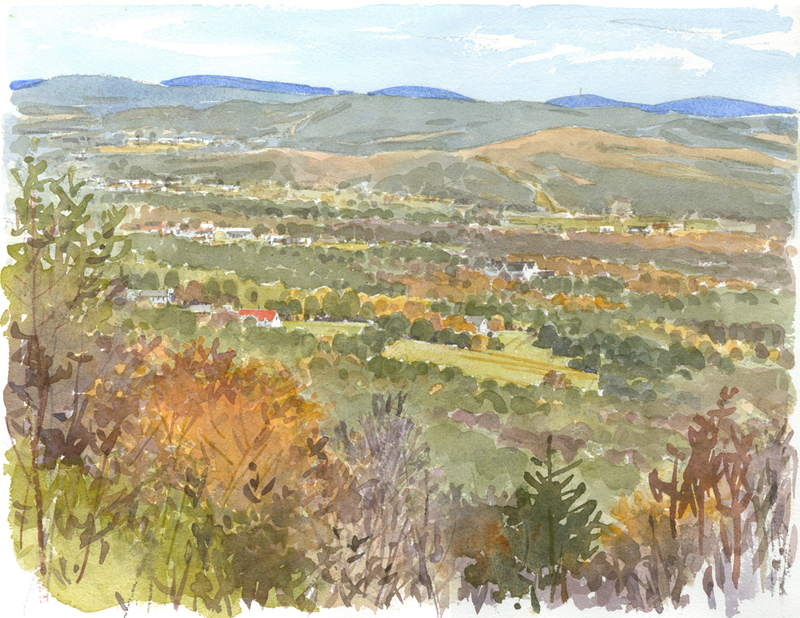 This view is to the north and west – Greylock to the north and the Taconic Range in the west. 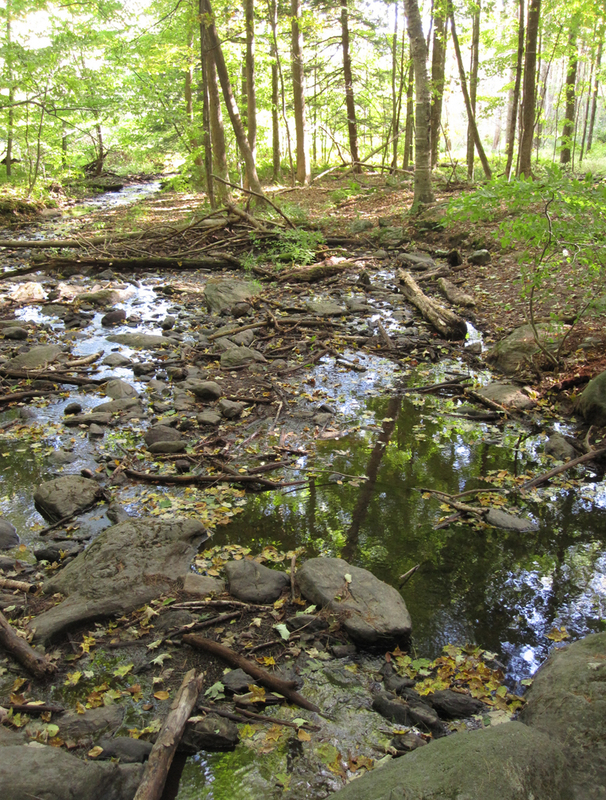 The eastern side of Lenox Mountain falls into afternoon shadow early at this date, and I have to watch my footing carefully as I descend the Overbrook Trail. The hemlock gorge is especially dark and gloomy, but the footing becomes easy again as the trail flattens out at the base of the mountain. 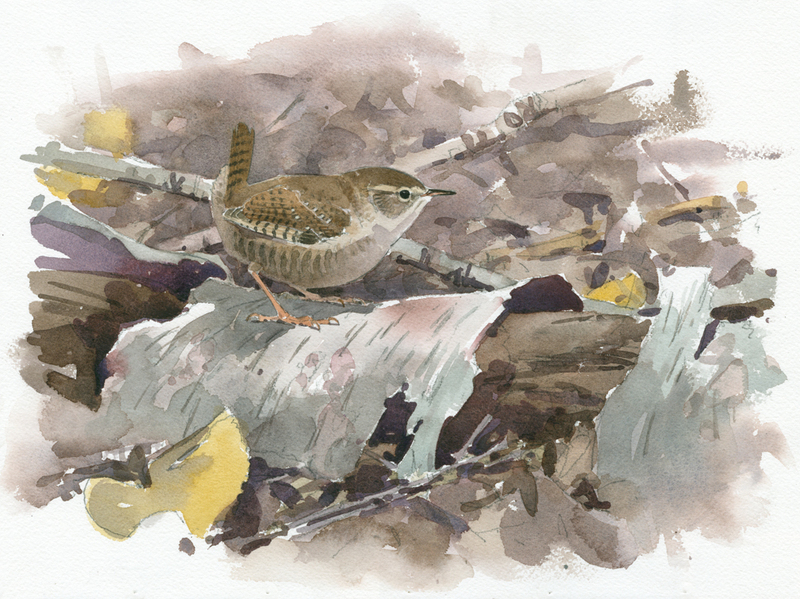 On the Bluebird Trail, a fleeting brown blur darts under the boardwalk as I approach. 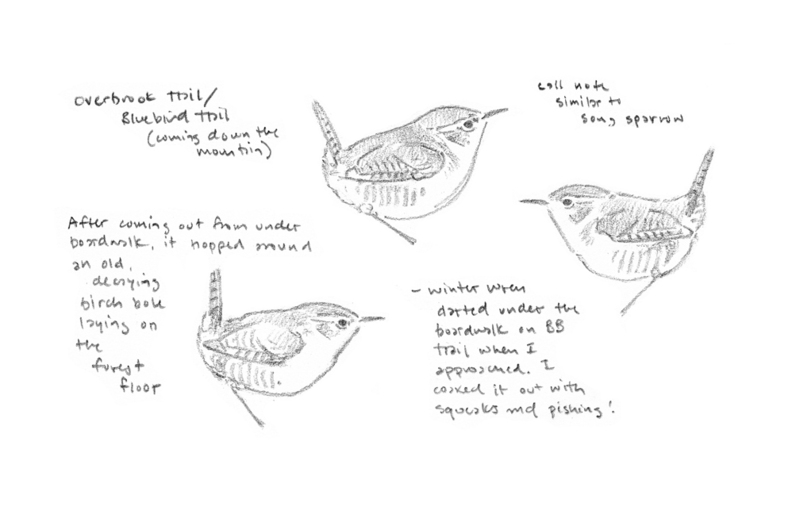 I pause and make some soft squeaks and “pishes” – enough to coax a winter wren out into the open. It makes some quiet notes that remind me of a song sparrow, and hops around some decaying birch logs on the forest floor. I make some sketches – noting that impossibly short (and jauntily cocked) tail. What a charming imp! 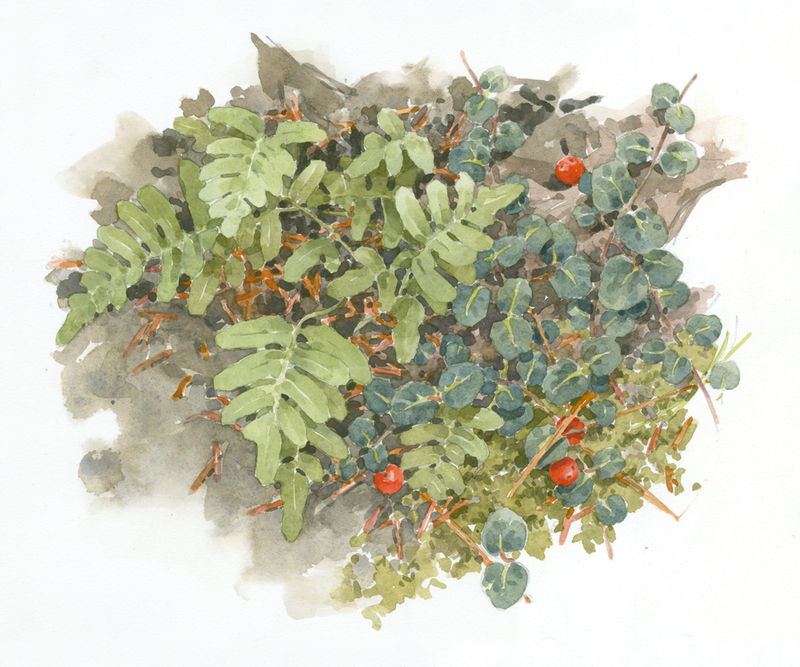 This entry was posted in Artists, Barry Van Dusen Residency, News, Wildlife Sanctuary and tagged Beaver Lodge Trails, Berkshires in autumn, carmine, Cattails, cold nights, Common Yellowthroat, crisp dawns, gold and violet, Greylock, hobblebush, Lenox, Lenox mountain, Magnolia warbler, miniature ferns, Old Wood Road, orange, palm warbler, partridgeberry, Pleasant Valley Wildlife Sanctuary, polypody, Taconic Range, Turkey Vultures, wamp maples, warm afternoons, winter wren, Yokun Brook on January 24, 2017 by Barry V..